As I continue to celebrate my 25th birthday and try to be happy about what I have accomplished in the last quarter century this little quote gives me strength. It is easy to look around and compare yourself to others and all the wonderful things they are doing and forget about all the wonderful things you get to do. I feel like this has been true in my life. I have spent more time than I'd like to admit worried about the future and about my progression or lack thereof. 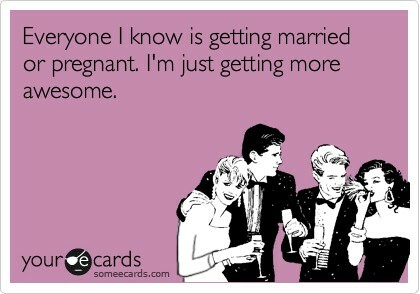 With an increasing number of my friends getting hitched and babied, I sort of freaked out a little and lost sight of my own self worth. Instead of looking forward to turning 25, for the first time in my life, I was dreaded my birthday. The good news is, I'm totally over that and I'm loving where I am in life. My birthday was awesome and 25 is going to be a GREAT year. I get to go to grad school, intern in 4 different states, traipse around NYC, meet new people, learn new hobbies, spend time with my family, travel, and loads of other things. What is the key to my change of heart, you might ask??? One word. I am grateful for this awesome cake! I got it from my friend's in-laws over Thanksgiving break. It's not super clear so sorry about that. I am grateful for the Keate family and for them inviting me to St. George for Thanksgiving. It was a great weekend get away and the weather was SO BEAUTIFUL. I am grateful for good friends, like Becca, Kyle, and RUBY! We went out to Outback on Thursday (after all my birthday week exams) and Ruby was so cute. She is getting more and more of a personality and it is so cute to see her light up when she sees you. I am grateful for long distance love! Cards, phone calls, and flowers are always welcome! I am grateful for mission friends and all they do for me. Cody and Brad decorated the house for my birthday and we enjoyed LOTS of good food and conversation. This was also a good chance to remember how grateful I am for my mission and all it taught me. Turns out, it is fun to be grateful. I feel happier and more confident and ready to accomplish anything I put my mind to. Fact: "Gratitude turns what we have into enough."